Malignant pleural mesothelioma (MPM) is a relatively rare but aggressive form of cancer arising from the membrane covering the lungs and the inner side of the ribs. This type of cancer is most frequently a result of inhaling asbestos. Following asbestos exposure, it takes more than 20 years before the symptoms of MPM develop. Given the lag-time, the number of cases of MPM is expected to peak in the coming decade even though the use of asbestos has decreased significantly in recent years. Symptoms of MPM include breathlessness, cough, chest pain, fatigue, fevers and weight loss. Once it develops, MPM is usually associated with a poor rate of survival. However, the length of survival depends on the extent of the tumor at diagnosis (“tumor stage”), the type of mesothelioma and the patient’s response to treatment. Although mesothelioma is not usually curable, the length of survival can range from less than one year to several years. Treatment of this cancer depends on how far the cancer has spread once it has been diagnosed. The aim of treatment may be “curative”, i.e., to remove all of the disease, or “palliative,” i.e., to alleviate symptoms. If the aim is “curative,” there are two surgical options: “Extended Pleurectomy/Decortication” (P/D) or “Extrapleural Pneumonectomy (EPP). “Adjuvant therapy” refers to treatments which can be used in addition to surgery such as chemotherapy and radiation therapy. “Trimodality therapy” refers to using a combination of all three – chemotherapy, radiation therapy and surgery. P/D involves removing the outer and inner surfaces of the pleura (the lining of the chest cavity and the surface of the lung). 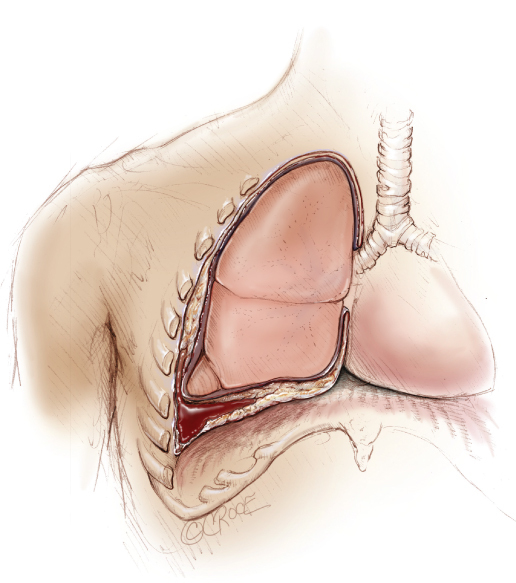 P/D may also involve removing the diaphragm and pericardium (the sac around the heart). EPP removes all of these same structures but also removes the lung. Of all the patients diagnosed with MPM, only a small proportion is considered suitable for these operations. There are a number of factors which influence the decision for the most appropriate treatment. These include the extent to which the disease has spread, the patient’s general health, and the specific type of cancerous cells. Patients will undergo a number of investigations including biopsies and scans to provide all the necessary information to help make this decision. There is evidence that “trimodality therapy”, including EPP or P/D coupled with chemotherapy and radiation, can offer benefits in terms of long-term survival. Many centers have reported survival beyond two years, and results are often better for patients who are able to complete trimodality therapy. These operations are not without significant risks, including mortality. EPP is associated with more complications than P/D. The most common complications include problems with the heart rhythm, infection of the lung, pulmonary embolus (lung clots) and myocardial infarction (heart attacks). These risks need to be weighed against the potential benefits for each patient.